A wearable robot is a mechatronic system that is designed around the shape and function of the human body, with segments and joints corresponding to those of the person it is externally coupled with. Teleoperation and power amplification were the first applications, but after recent technological advances the range of application fields has widened. Increasing recognition from the scientific community means that this technology is now employed in telemanipulation, man-amplification, neuromotor control research and rehabilitation, and to assist with impaired human motor control. 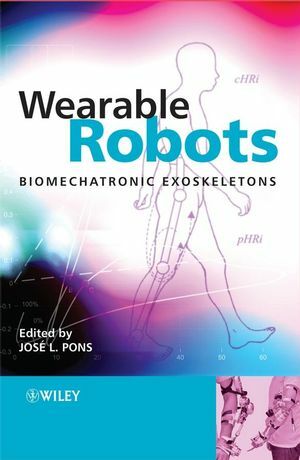 Logical in structure and original in its global orientation, this volume gives a full overview of wearable robotics, providing the reader with a complete understanding of the key applications and technologies suitable for its development. The main topics are demonstrated through two detailed case studies; one on a lower limb active orthosis for a human leg, and one on a wearable robot that suppresses upper limb tremor. These examples highlight the difficulties and potentialities in this area of technology, illustrating how design decisions should be made based on these. the study on the development of networks for wearable robotics. Wearable Robotics: Biomechatronic Exoskeletons will appeal to lecturers, senior undergraduate students, postgraduates and other researchers of medical, electrical and bio engineering who are interested in the area of assistive robotics. Active system developers in this sector of the engineering industry will also find it an informative and welcome resource. Jose L. Pons, is currently a Scientist for the Bioengineering Group of the Spanish Council for Scientific Research. He has previously written journal articles including for Humanoids and personal robots: Design and experiments, for the Journal of Robotic Systems, (Volume 18, Issue 12, Pages 673-690,4/12/2001). Pons has also written Emerging Actuator Technologies: A Micromechatronic Approach (0470091975) a book on the design and control of novel actuators for applications in micro nanosystems.